Top Notch Material: Dora and Friends: Doggie Day! Another great Dora movie that will be released on August 4th to tell you about! 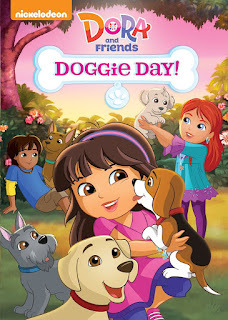 Dora and Friends: Doggie Days combines education with fun puppies with most children love! I know both of my boys love any puppy themed shows so they are both in heaven watching Doggie Day! I love anything that teaches my youngest (two) about teamwork, and especially shows that also offers education like Dora does! You learn about different animals and also learn some Spanish words. We have been very pleased with this DVD and it has kept my boys entertained during the long "dog days of summer!" You can pre-order this DVD right now through amazon for less than $10!